As part of the CGIAR Research Program on Fish (FISH), WorldFish is teaching rural households in Myanmar to grow micronutrient-rich small fish alongside carp—an approach that research shows can boost consumption of fish and impact on nutrition outcomes. In Myanmar, fish is an important part of the diet. Households spend nearly as much money on fish (14 percent of food expenditure) as on rice (19 percent), and average fish consumption is estimated to be just above the global average at 21 kg/person/year. But, these figures hide a range of consumption patterns. Women and children tend to eat less fish than men due to social norms that affect the distribution of food within a household. And despite fish being a cheap animal-source food, it is often still unaffordable to poor, rural households, resulting in diets that rely heavily on rice and are low in diversity. These factors contribute to the country’s high rates of undernutrition, which are the highest in Southeast Asia. Among children under five years old, at least 29 percent are stunted, 7 percent are wasted and 19 percent are underweight. Nearly half of all women are anemic, with pregnant and lactating women most affected. To improve the nutrition and livelihoods of poor, rural households, the IFAD-funded MYNutrition project (2015–2019) aims to increase household production and consumption of micronutrient-rich small fish and vegetables, particularly among women and young children, as well as boost household income through the sale of fish. Led by WorldFish in collaboration with the Department of Fisheries and local non-governmental organizations, MYNutrition is part of the CGIAR Research Program on Fish. The project focuses on the Ayeyarwaddy Delta, where malnutrition rates are among the highest in the country and there are 200,000 subsistence fish farms, many of which are underutilized or derelict. 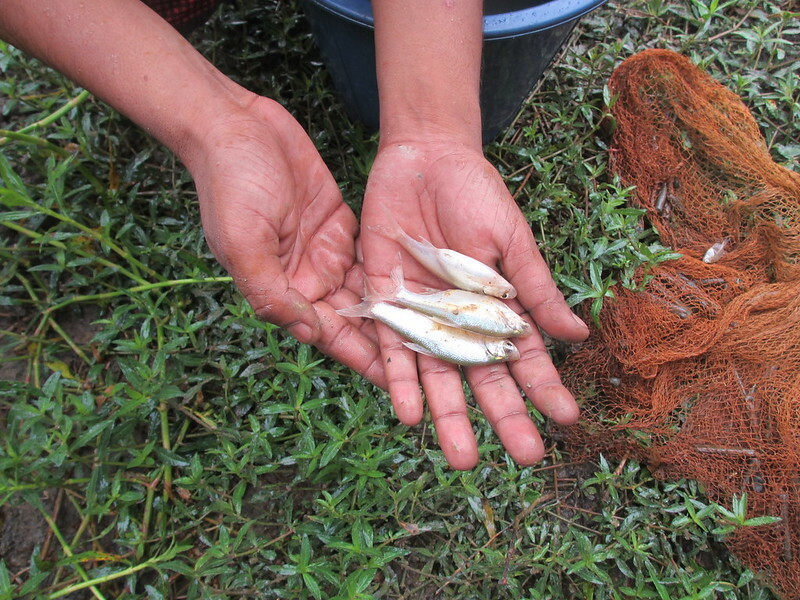 The project provides training to women and men in targeted households on how to grow carp species alongside micronutrient-rich small fish species such as mola (nga bel phyu) in homestead ponds, a system known as carp-mola polyculture. This technology was first implemented in Bangladesh by WorldFish in 2011. Research shows that the technology is an effective, low-cost, nutrition-sensitive approach that increases pond productivity and the nutritional quality of the total production, and promotes small fish consumption in the household. Mola is a small indigenous fish species that grows well with other fish and reproduces frequently in the pond. It can be partially harvested often, providing a constant supply of fish for household consumption. This makes mola the ideal species to farm alongside carp species, which account for around 70 percent of all farmed fish in Myanmar. “Small fish are easy to farm, because no special techniques or feed are needed,” explains 51-year-old Daw Aye Win from Mal Nyo village, who began practicing carp-mola polyculture in her homestead pond in early 2017 after attending project training. “I would encourage other farmers to replicate what I am doing by using any water source they have available, be it an irrigation channel, pond or rice field. “When the dry season is approaching, you will not worry about food because you already have access to food from your own home,” says Daw Aye Win, who also grows vegetables on the dykes surrounding her pond. A key benefit of producing carp species and mola is that, after household consumption, any surplus production can be sold. This provides an important and additional source of income for poor households in Myanmar, where the minimum wage is USD 2.60 (MMK 3600) per day for eight hours’ work. When eaten whole, mola is an excellent source of micronutrients such as vitamin A, iron, zinc, calcium and vitamin B12, as well as fatty acids and animal protein—all of which are needed for good health and development, particularly in the first 1000 days of life. But traditionally, the head and organs of mola—the most nutritious parts—are removed before cooking. 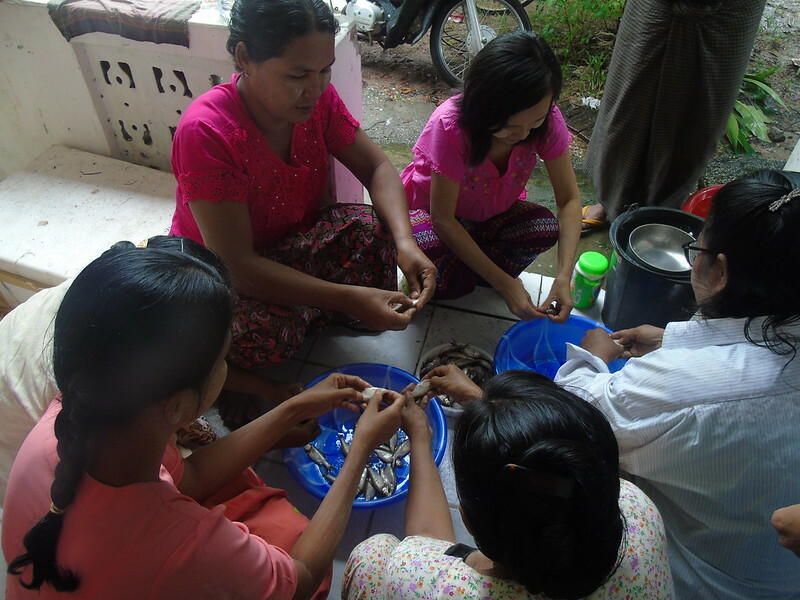 As part of the training on essential nutrition and hygiene actions, family members learn about the nutritional benefits of mola and the best ways to prepare the whole fish, such as fried mola balls and mola ball soup with vegetables. “At home, I now cook mola whole. And I’m teaching other mothers in the village to do the same,” explains mother-of-three Daw Aye Win. The project hopes word-of-mouth sharing about nutritious ways to cook mola will help to boost household consumption of small fish among 700 households engaged in small-scale aquaculture. 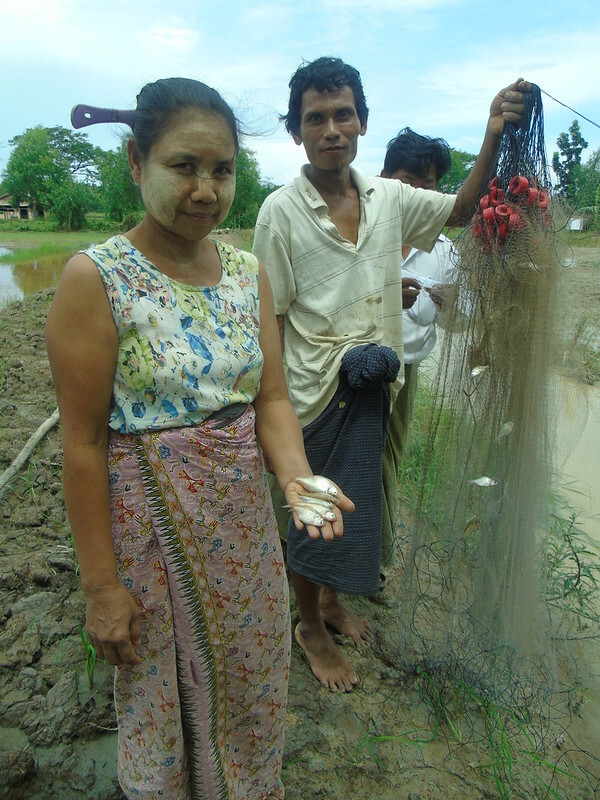 These households are also being supported by the complementary WorldFish-led MYCulture project (2015–2018), which works to engage smallholders in the fast-growing aquaculture sector in Myanmar. To reach this target, the project will also draw on lessons learned by WorldFish and partners in nearby Cambodia, where nutrition training was given to fishing-dependent households between 2012 and 2016. This helped to boost household consumption of small fish by 13 percent on average, and increased consumption of small fish by children under five years of age by 23 percent among households in the project target areas. Addressing malnutrition is a complex challenge. But efforts by WorldFish and partners are helping to tackle some of the immediate and underlying causes, by boosting dietary diversity and improving household incomes, which is enabling poor households to lead better and healthier lives. It is for these reasons that Daw Aye Win will continue farming mola and carp species. “If I have a chance to build more ponds or access more land, then I will expand my production of mola because it is easy to farm and can help my family achieve good health,” she says.